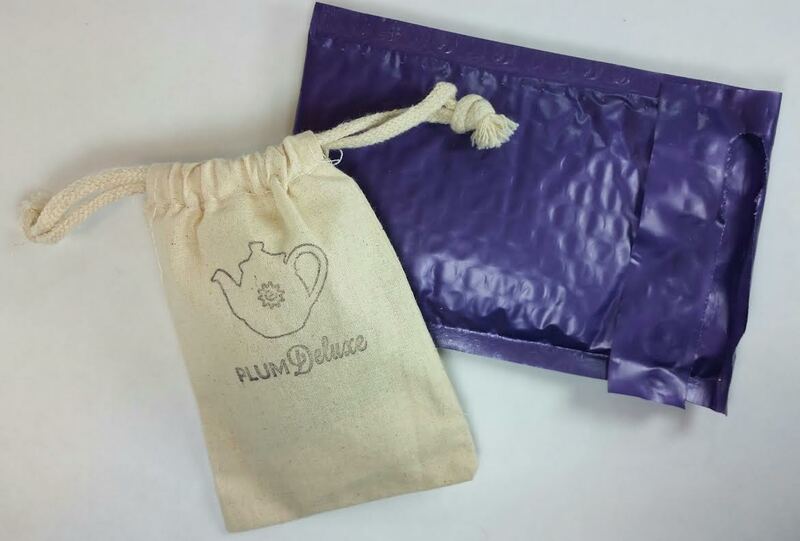 Plum Deluxe is an organic, fair trade, non-GMO tea subscription that uses no sulfites or chemical flavorings. As a tea lover, it's always fun to try new types and blends of tea. I personally tend to prefer herbal and black teas but rarely turn my nose up at anything other than lapsang souchong. Lucky me, Plum Deluxe deals mainly in black and herbal teas. What You Get: Casual Sipper receives a 1oz blend of organic, fair trade tea each month. Daily Cuppa receives two 1oz blends in a month. Both subscriptions have access to online forums, free shipping and discounts in their shop. Your shipment will arrive in a purple envelope and inside will be a muslin, hand stamped bag. I was glad to see that the tea was in a resealable pack. It's one of the things I really require in a tea sub. I don't want to have to fuss with finding a way to keep tea from spilling everywhere. 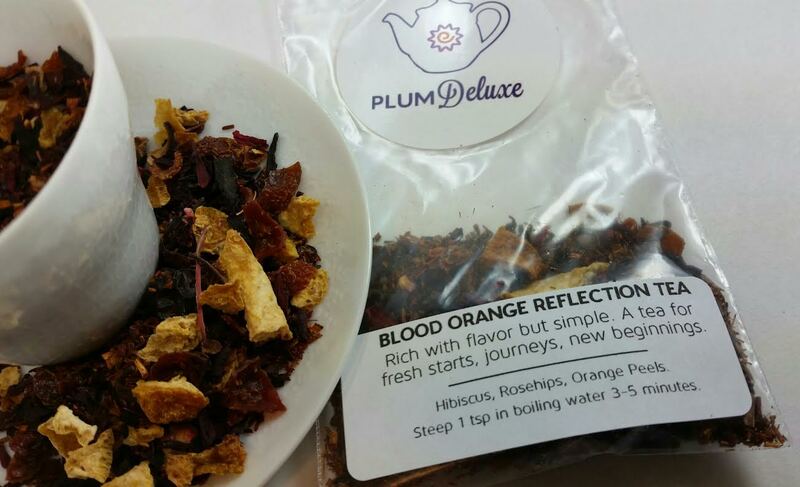 This months blend is the Plum Deluxe Blood Orange Reflection Tea. When you order you can choose to receive caffeinated or herbal tea. January's blend happened to be herbal which pleases me because I enjoy herbal teas. Mainly because I can drink them at any time of the day and not worry about staring at the ceiling at 2am. 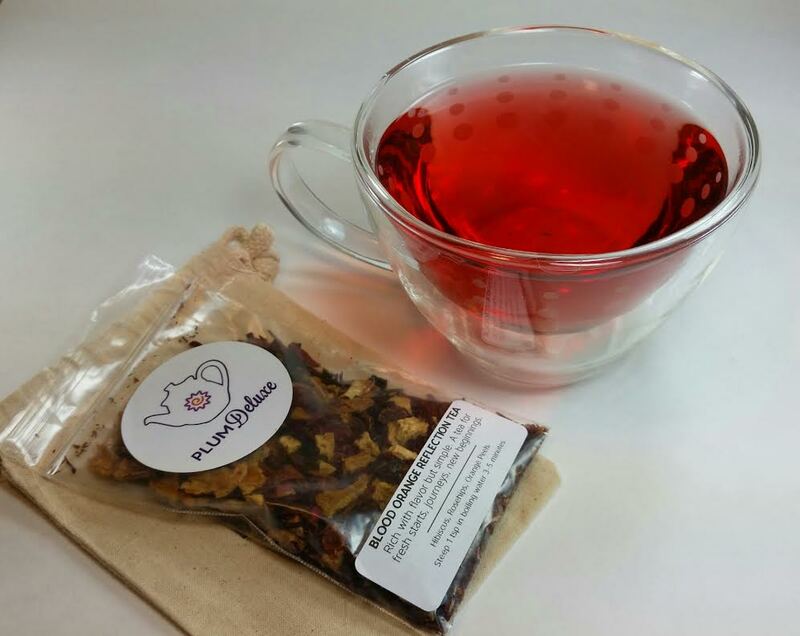 The hibiscus in this blend makes the tea a gorgeous pinky red. With this particular blend, I found that it really needs to be shaken up or care taken when measuring it out to get some of everything. The smaller bits sit at the bottom. I usually use a tea strainer or a disposable tea bag when using loose tea. I used a tea bag this time because I think the big orange peel pieces crushed the hibiscus to death, making it a little dusty. This has that wonderful sharp bite from the hibiscus nicely rounded out by the orange peels and rosehips. It's wonderful! I highly suggest pairing this with a nice 70% dark chocolate. Mmm! 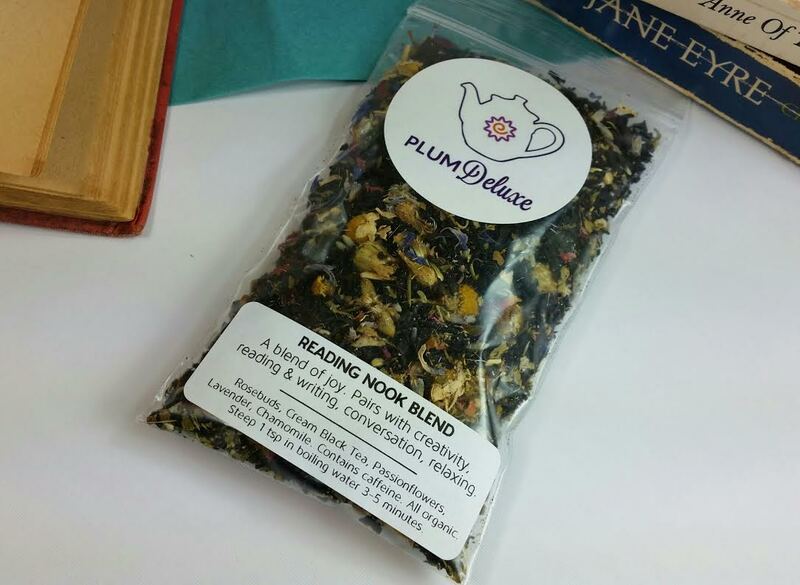 Plum Deluxe also has a small online tea shop where you can purchase some of their most popular organic and fair trade blends for very reasonable prices. Plum Deluxe was kind enough to send their favorite blend for taste testing! This is the Reading Nook Blend. This has black tea leaves supplemented with rosebuds, passionflower and lavender for flavor and aroma, along with a bit of chamomile. This tea has a very creamy mouth feel and a delicious scent. The pairing of herbs with the black tea makes for a very smooth and comforting cup. I couldn't get enough with my first cup and had to get a second. It went very nicely with my lemon pound cake. I can see why it's a popular blend. It's infinitely drinkable, perfect just the way it is. My second cup I added a little honey to see how it would fare. The sweetness of the honey made it a little softer but still very flavorful. Each bag is one ounce and costs $7 plus shipping. It's definitely nice to be able to see the teas and choose the ones that fit your tea-style the best. VERDICT: These Plum Deluxe tea blends were both delicious. Each bag has about 15 cups worth of tea so I'll be able to enjoy this for quite some time. Since I am an equal opportunity tea drinker, I can be happy with store-bought tea bags and loose teas like this. I think my main wish is that there were two teas a month for the $10 price. An ounce is actually a lot of tea so I wouldn't mind getting half an ounce of two teas. But for a tea subscription, it's really quite reasonable. Other subscriptions have sent four teas but only a quarter ounce each for over $20. So for a tea subscription, this is the most affordable one that I've encountered. It meets my main criteria of being under $20 and though the bags are plastic, they are resealable. 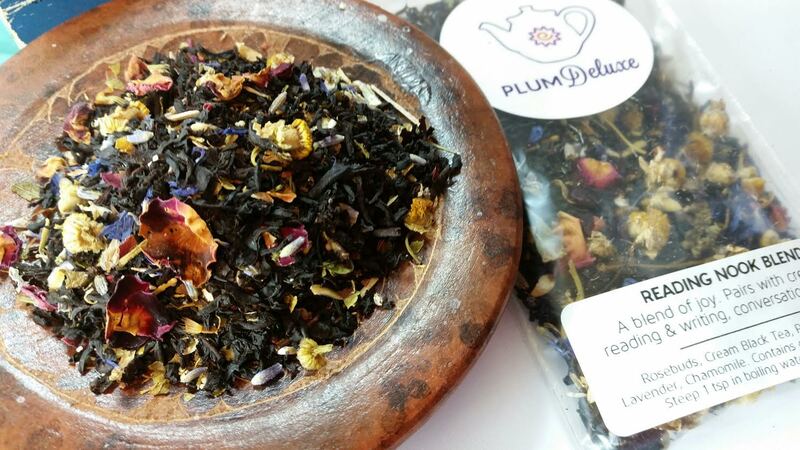 All Plum Deluxe teas are hand-blended in Portland, Oregon. Each 1oz packet makes 15-20 cups. Only organic ingredients are used. There are no sulfites, no artificial chemicals, and are all non-GMO. If you would like to check out Plum Deluxe subscriptions and their shop, head to their website and take a look! *These teas were sent to me complimentary for review purposes. No compensation was received for this post and all opinions are completely my own. Thanks for sharing the Plum Deluxe love - yum yum! Reading Nook Blend sounds amazing! Love the name too.